Building on the success of the previous three editions, Foundations for Microstrip Circuit Design offers extensive new, updated and revised material based upon the latest research. Strongly design-oriented, this fourth edition provides the reader with a fundamental understanding of this fast expanding field making it a definitive source for professional engineers and researchers and an indispensable reference for senior students in electronic engineering. 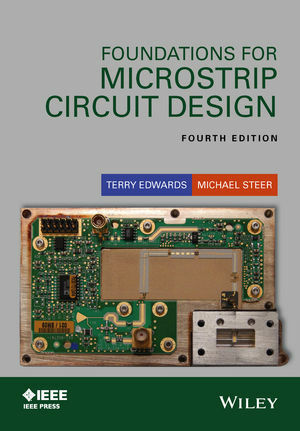 Topics new to this edition: microwave substrates, multilayer transmission line structures, modern EM tools and techniques, microstrip and planar transmision line design, transmission line theory, substrates for planar transmission lines, Vias, wirebonds, 3D integrated interposer structures, computer-aided design, microstrip and power-dependent effects, circuit models, microwave network analysis, microstrip passive elements, and slotline design fundamentals. Terry Edwards gained a Diploma in Technology (Eng.) at what is now London South Bank University. During his early career he was a senior development engineer for Ultra Electronics. This carried the responsibility for the microminiaturisation of electronics on the control system for the Concorde jet engine. Technology has been a constant theme for his career and he moved into lecturing basic electrical engineering and electronics at High Wycombe College of Technology & Arts. He took on a landmark role of senior lecturer at La Trobe University in Melbourne, Australia that involved him launching and teaching solid state microwave technology. Until recently he was Executive Director of Engalco Research, a strategic commercial and military industrial consultancy and research organization. Engalco is well known for providing industry and market data reports in the field of microwave products for defense and SATCOM applications. From January 2014 Terry has been leading a new management and technology venture names Edwards Research Associates. Michael Steer is the Lampe Distinguished Professor of Electrical and Computer Engineering at North Carolina State University (NC State). He is a Fellow of the IEEE (the Institute of Electrical and Electronics Engineers). He was Secretary of the IEEE Microwave Theory and Techniques Society (MTT-S) in 1997 and was a member of the MTT-S Administrative Committee from 1998 to 2001, and from 2003 to 2006. He received a Service Recognition Awards from the Society in 1998 and 2001.